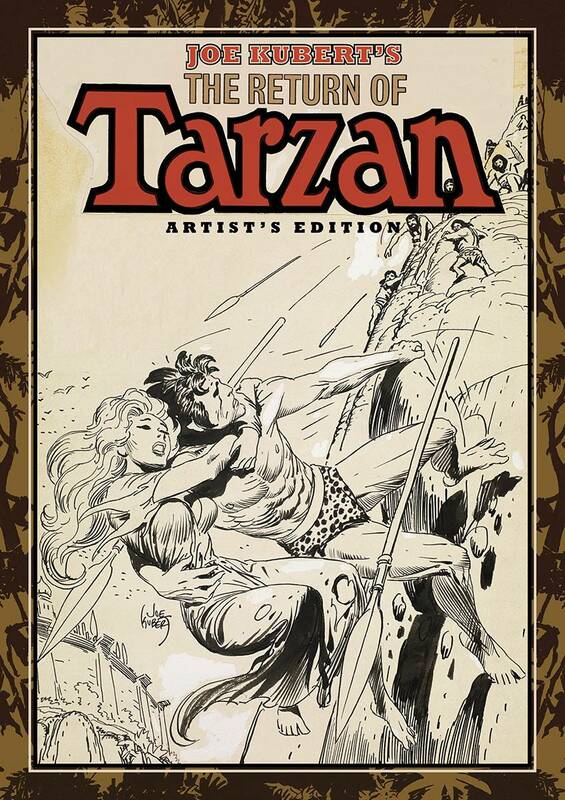 The second volume of Joe Kubert’s acclaimed Tarzan series is collected in IDW Publishing’s award-winning format. 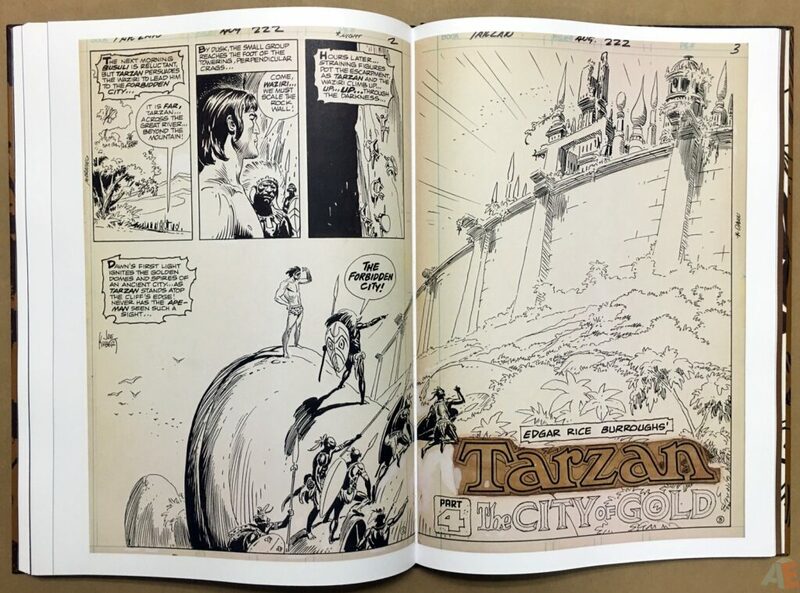 Collecting issues #214, 217 – 223, this beautiful tome features three stand alone adventures, as well as the epic saga detailing The Return of Tarzan! 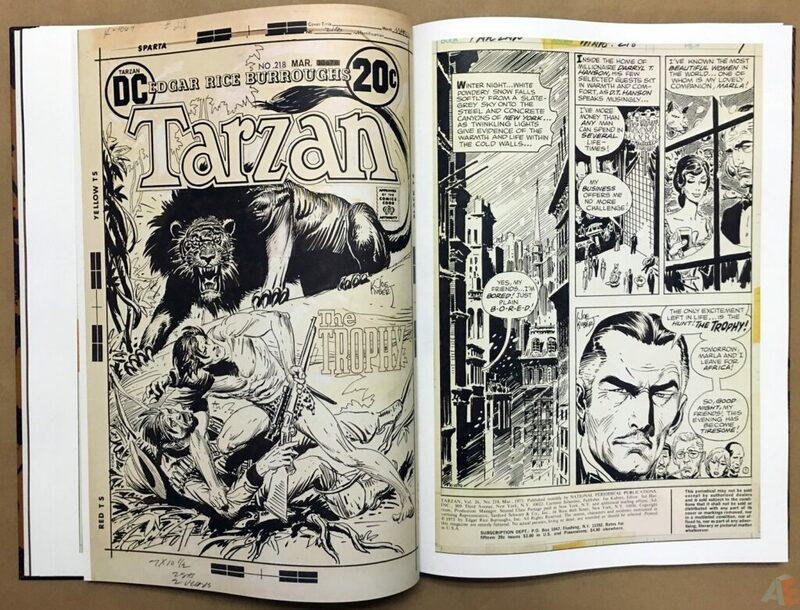 Each and every story page has been scanned from Joe Kubert’s original art, and all but two of his covers (but we’re tenacious, we keep looking until the very last minute!). 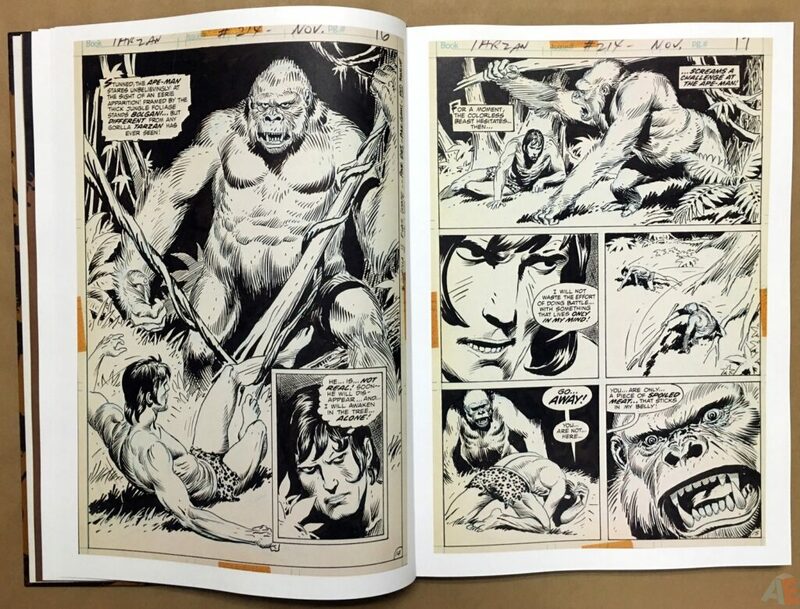 This is the fourth IDW Joe Kubert Artist’s Edition… some may say that’s too many for a single artist. 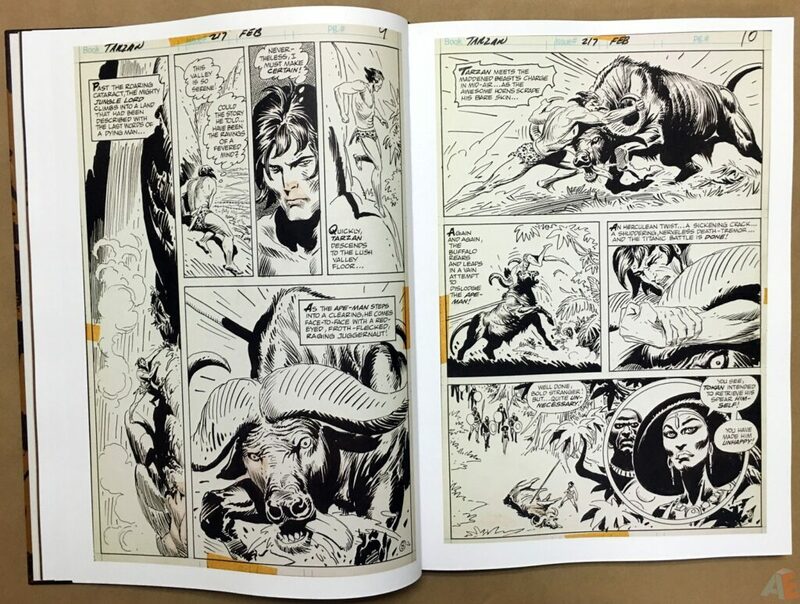 We say, you just haven’t seen enough Kubert work! 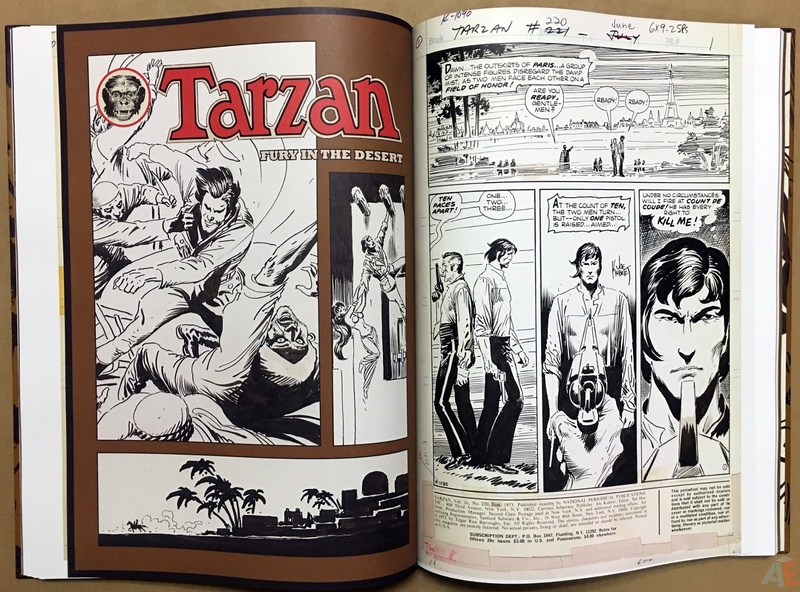 IDW’s fourth Joe Kubert Artist’s Edition and their second featuring Tarzan. 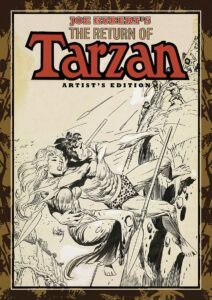 The complete five issue run of The Return Of Tarzan is included, along with three other stand alone stories. 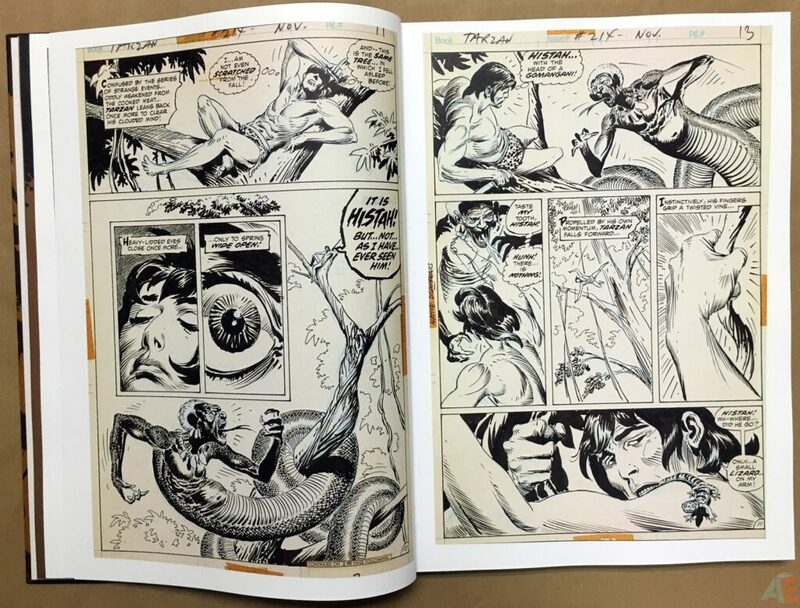 This volume is all thriller and no filler: every page is scanned from the original art. 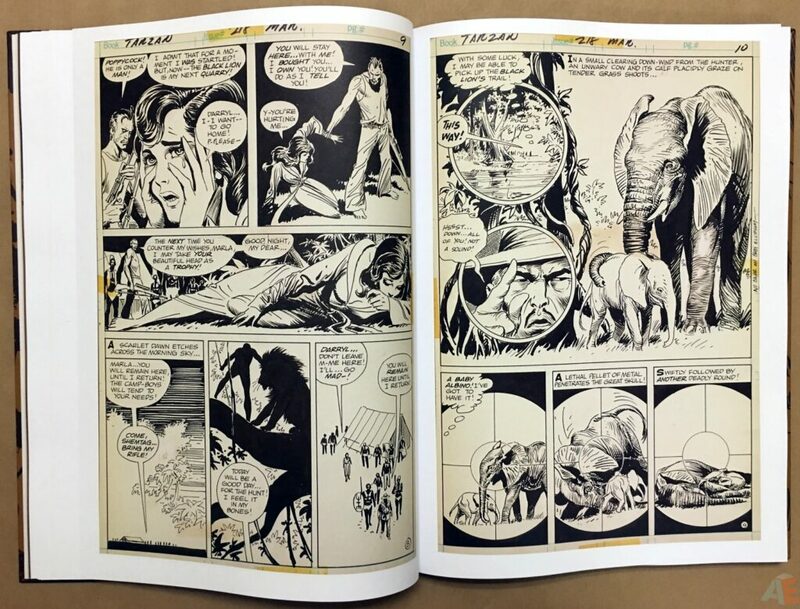 Going through this volume made me stop and admire Kubert’s techniques for saving time with panels. 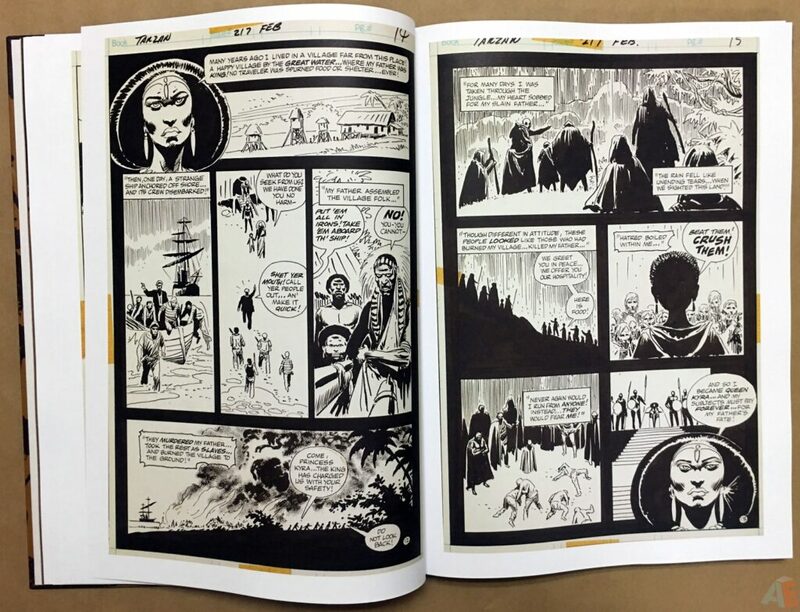 The silhouette panel pops up time and time again, but it works on those pages. 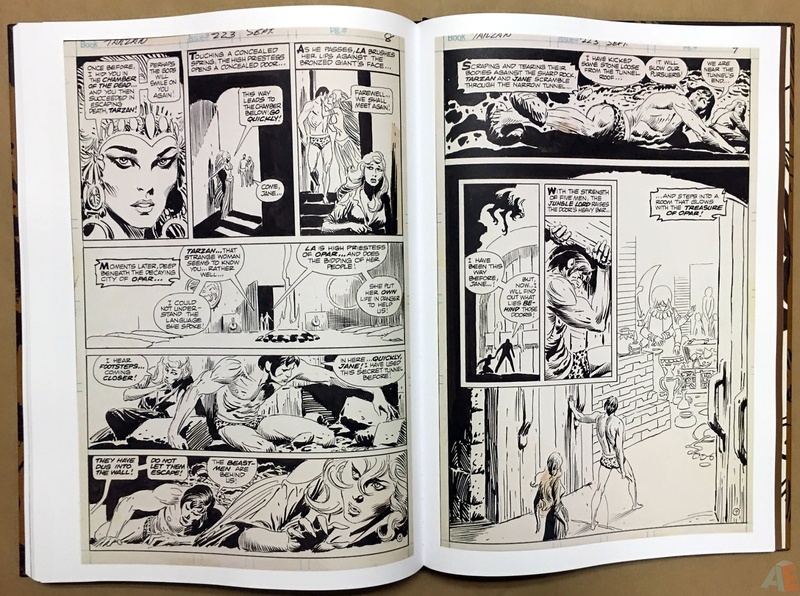 Paste ups of previous figures, black backgrounds or no backgrounds when zooming in all save time but play so well into the page compositions. All scans are clear and crisp. 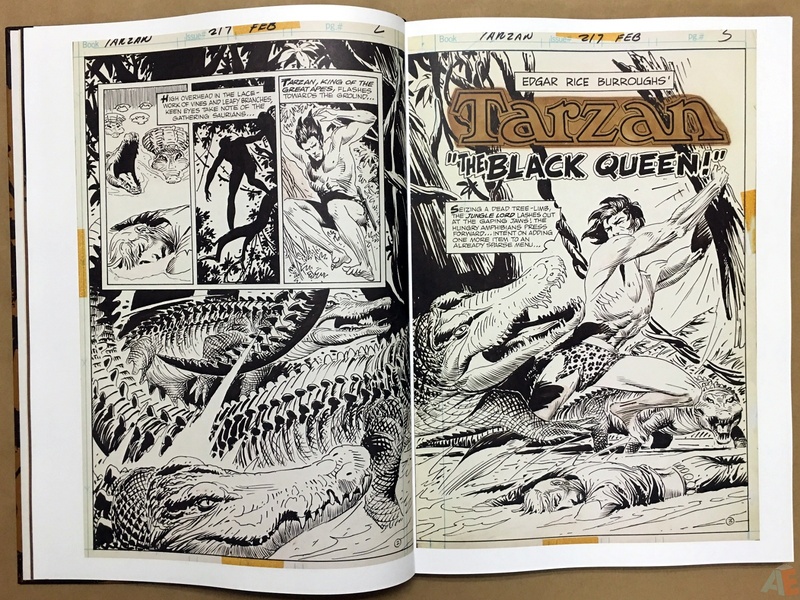 Blacks show gradients throughout. 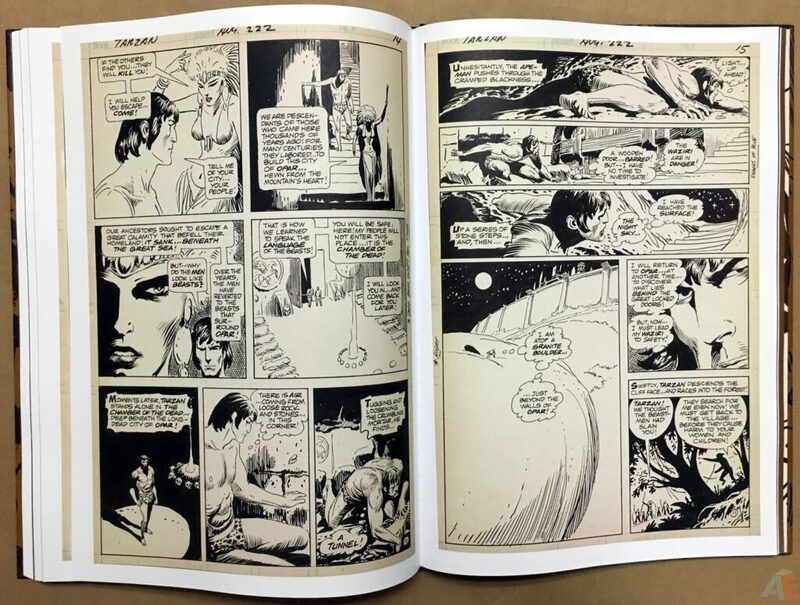 The pages have a consistent tan aging to them, with the occasional light to dark brown. The paste ups really stand out as they’ll all dark brown. 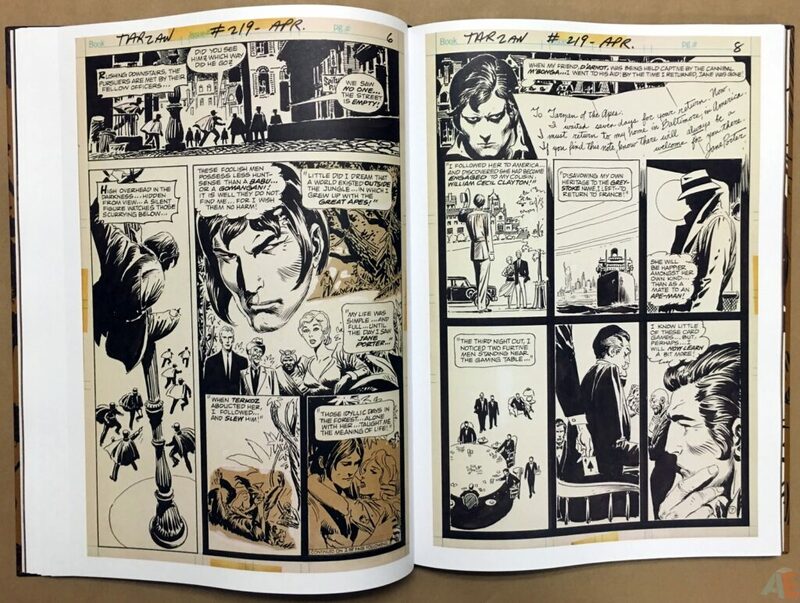 Kubert didn’t make any notes on the margins, and the only corrections are blue pencil in some of the word balloons. 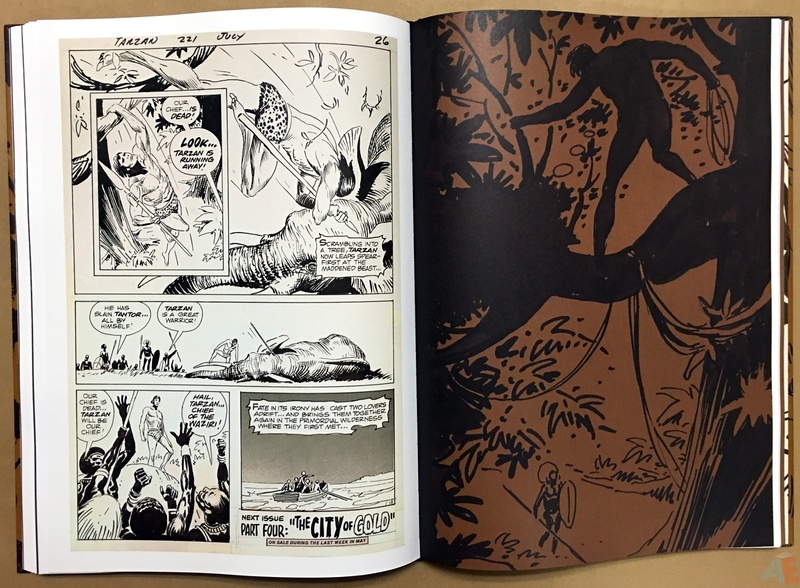 I love Dahlk’s designs for this book. 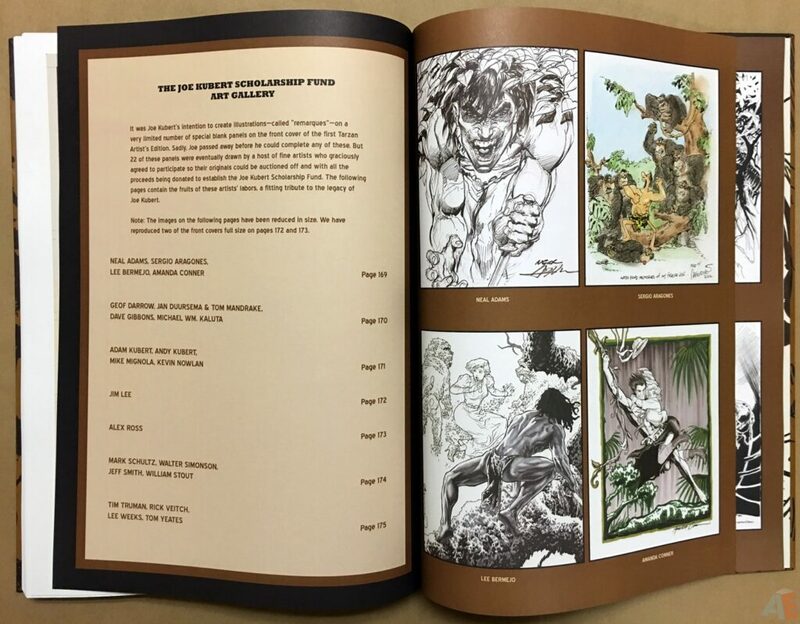 No rehash of volume one here: fresh and unique. 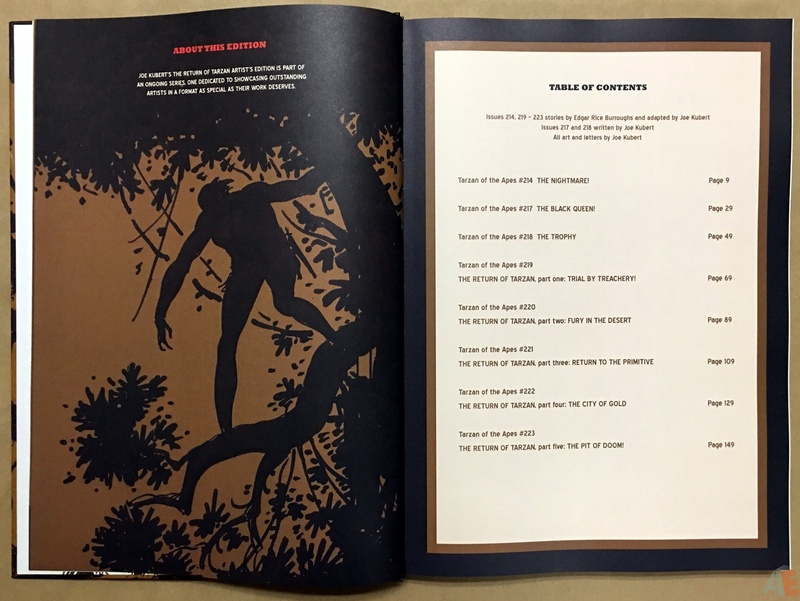 The brown and black with red accent carry through from cover to cover. 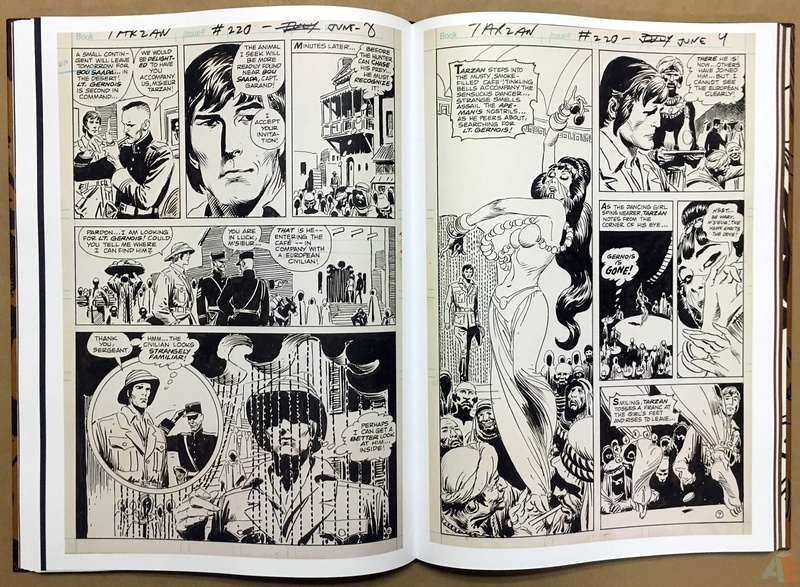 Chapter dividers of enlarged and shaded panels follow each issue, and although most covers are included Dahlk filled in for the missing with his signature cover replacements. 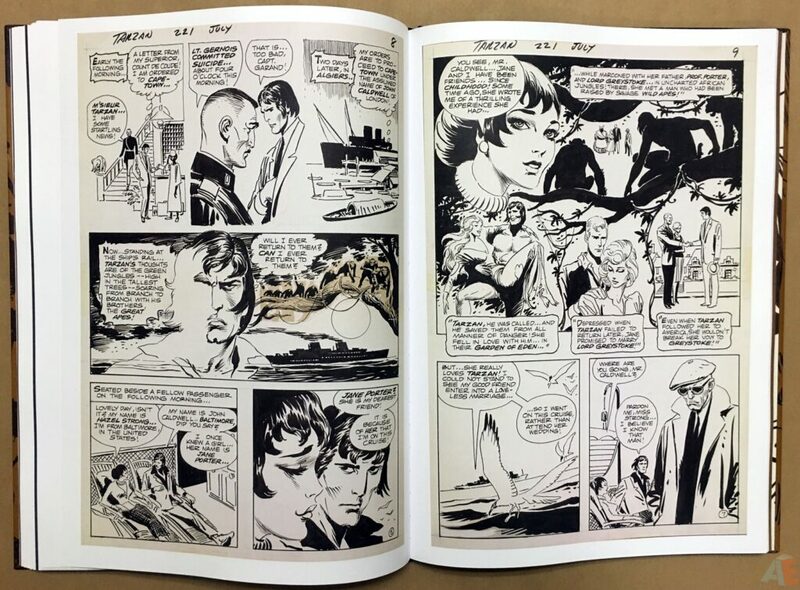 Oddly the endpapers are straight black and white enlargements. Production is top notch. 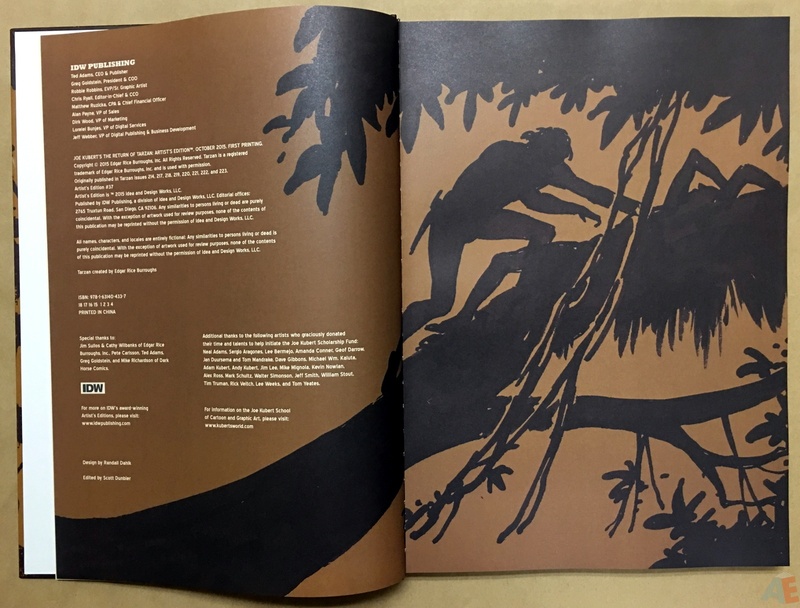 Sewn binding with heavy matte paper stock. 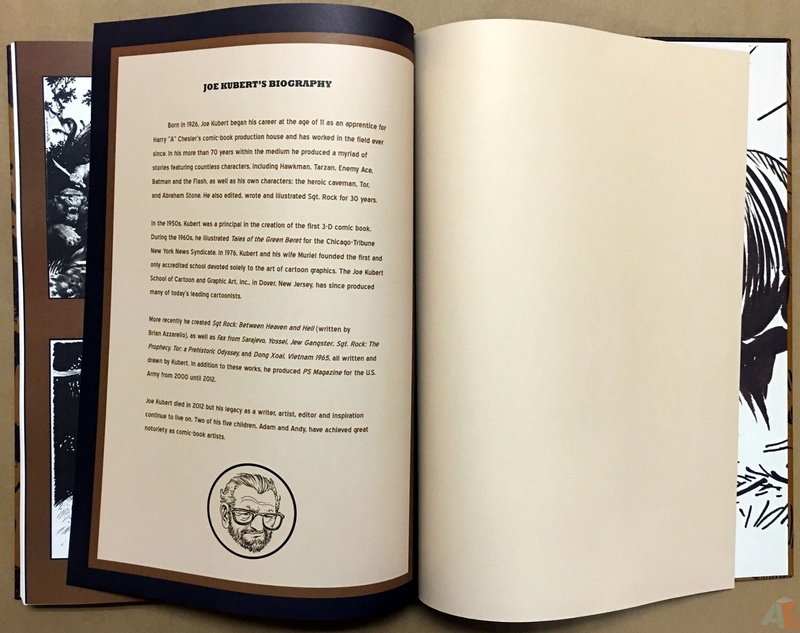 The book comes in a cardboard case with a small cover and UPC sticker. 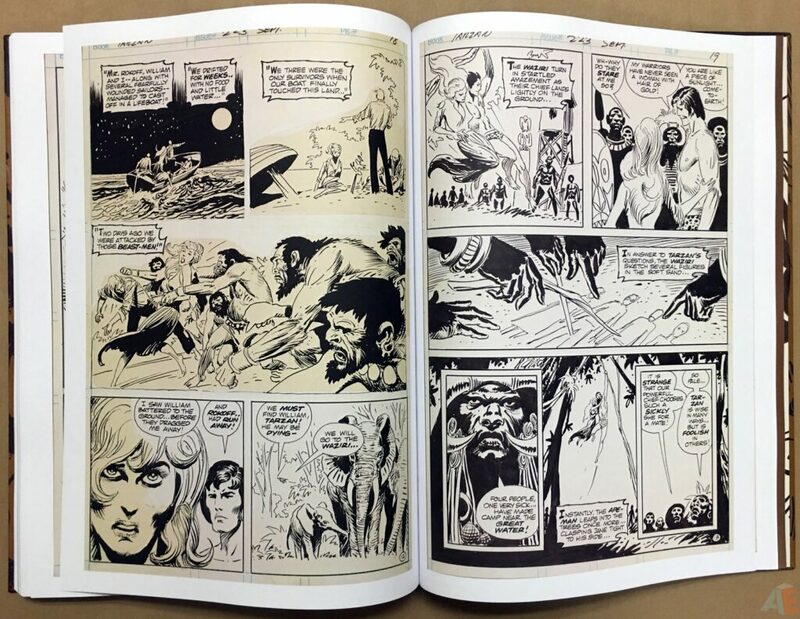 I don’t believe it was shrinkwrapped, but that detail eludes me. Extras are a unique collection. 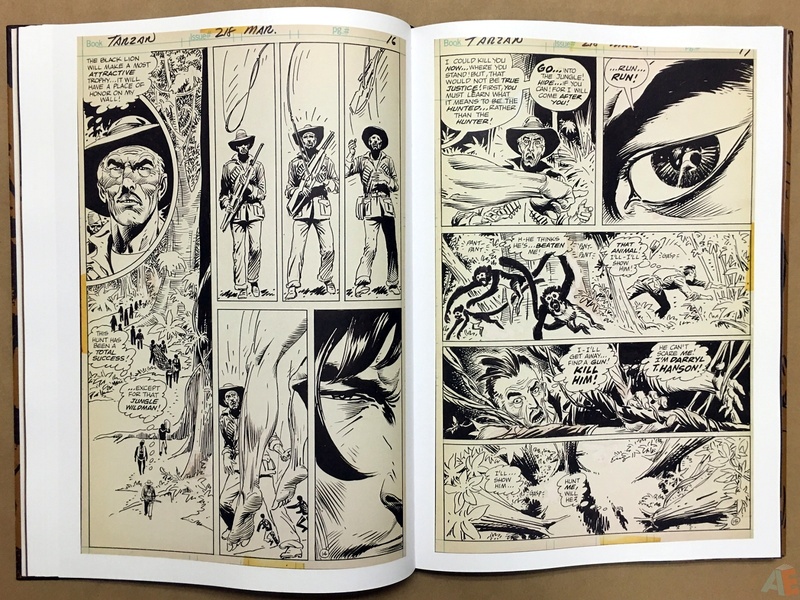 The introduction from the first volume is used again here, and there is no gallery of Joe Kubert art following the main issues. 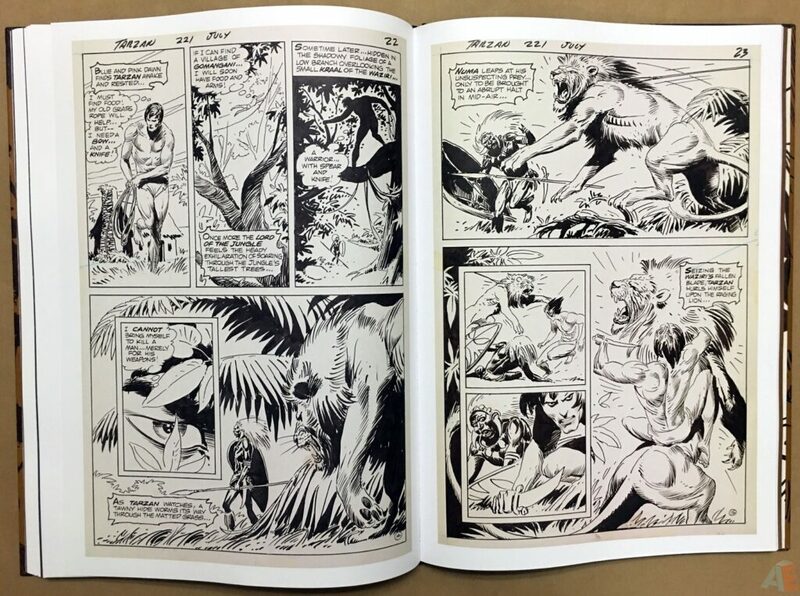 Instead we’re treated to a collection of Tarzan images from a who’s who of comic talents. 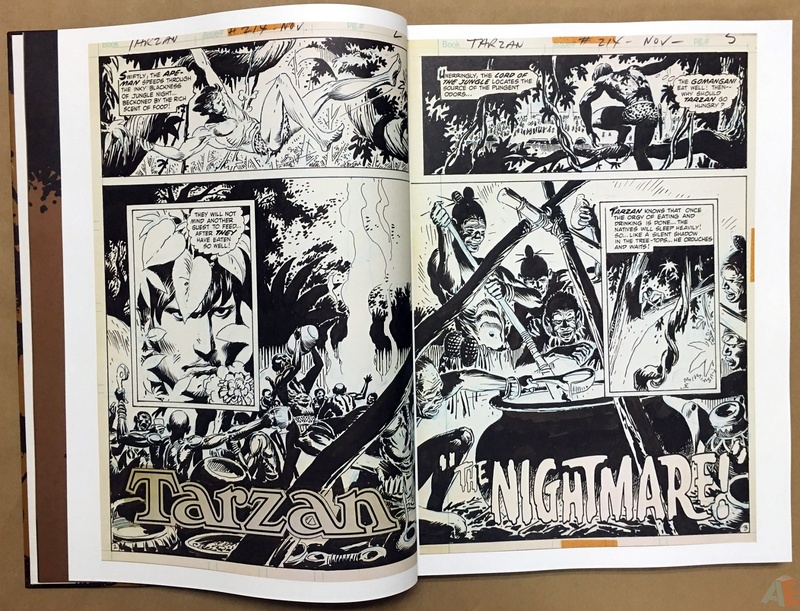 It was Joe Kubert’s intention to create illustrations – called “remarques” – on a very limited number of special blank panels on the front cover of the first Tarzan Artist’s Edition. Sadly, Joe passed away before he could complete any of these. 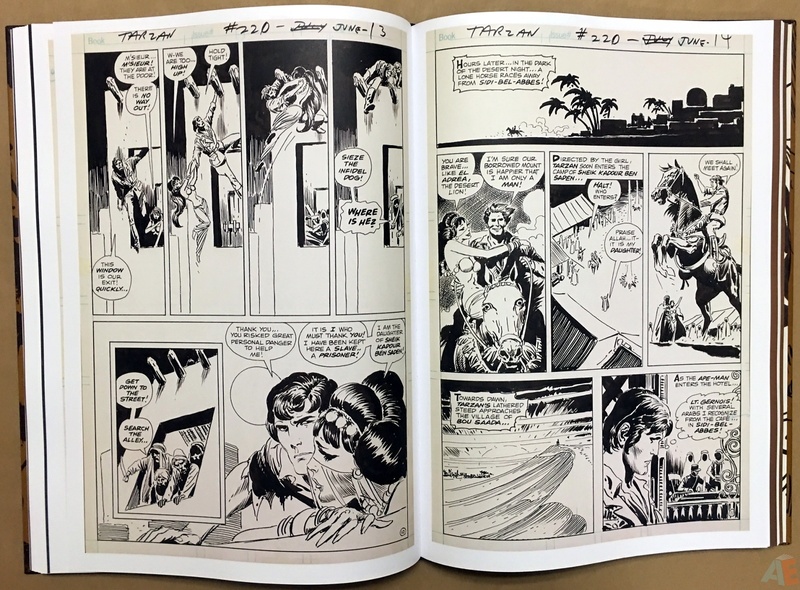 But 22 of these panels were eventually drawn by a host of fine artists who graciously agreed to participate so their originals could be auctioned off and with all the proceeds being donated to establish the Joe Kubert Scholarship Fund. 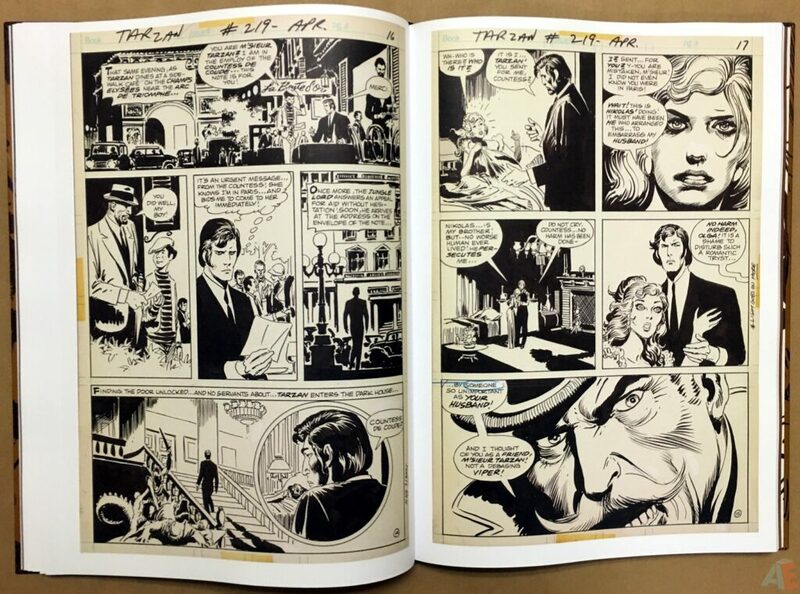 The press release from the event and all covers can be seen here. 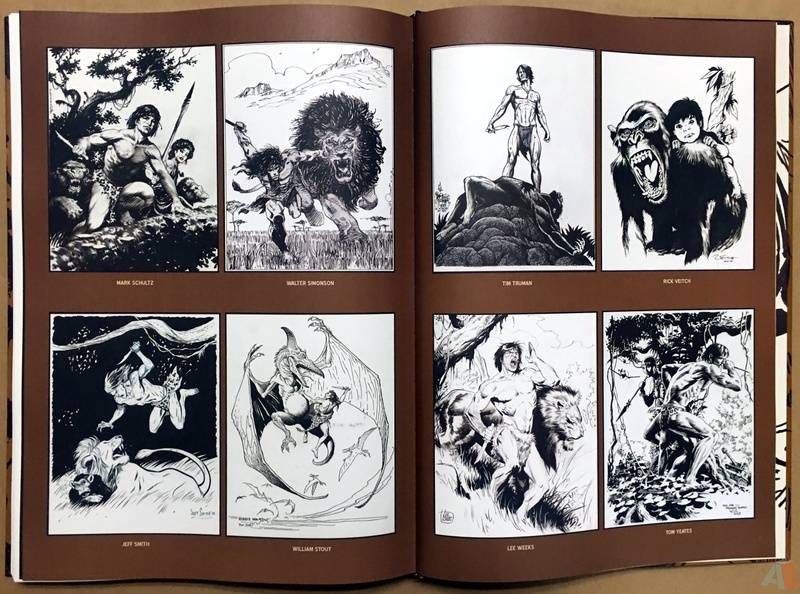 All twenty-two images are included, with twenty of them four to a page and two at full size.